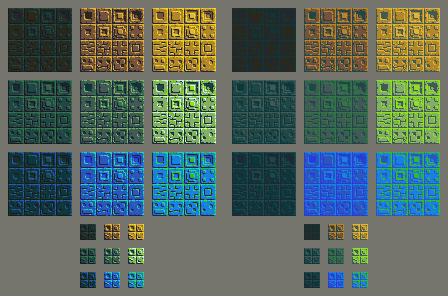 A sheet of 20 block textures, 16 large (16x16 pixels), and 4 small (8x8 pixels). I provided 9 color samples with 2 variations per color for foreground/background use. A sample mockup is also included. The color palette is a work in progress so you may find it helpful to adjust the colors to suit your needs. Awesome! I bet these could be adapted really well to DB's 16-color or 32-color palette (since you were trying to figure one out). Yeah I might just do my next batch of tilesets in DB's palette for compatibility sake. I'm building up experience in color theory myself but it's a tricky subject to say the least. Really love this. Thanks so much for sharing! thanks for sharing! These are great! I really like the aged/worn look they all have, gives them a very organic feel despite being clearly man-made. @capbros Thanks! I'm glad they read that way too, because that's pretty much exactly what I was going for. I gave you credit in the end game sequence for it and i very much appreciate the clean sprite sheet and quality of graphics. It's a Metroid-a-like (if that's even a word) or Metroidvania type of game. 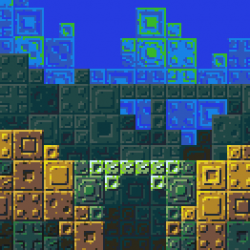 Old school platform, sidescroller. It turned out great and i wanted to drop a personal thank you for uploading these graphics!